Hey my loves! I’m putting it here so hopefully I am accountable, but I am going to try an instagram live of one of these recipes. If you have a preference, let me know. I have no idea how to work it and swear a lot when I am nervous but maybe we try it anyway. Another q I have received that is worth noting here. Sea salt and Kosher salt are not equally measured. This is not a huge deal if you are someone who seasons to taste, but if you are a measurer, you will notice a difference. Most real chefs use Kosher salt, but I use sea salt because it’s usually less expensive and what they sell in bulk at Costco and I use it often. I should probably switch, but ‘til then, know that Kosher is a larger grain than sea salt, so it does not disperse as much, so you would need to use a bit more Kosher salt than the sea salt measurement I call for. Flake salt is an even different thing, but something you’d use for finishing, not for everyday cooking. By volume, sea salt is saltier than Kosher, due to the size of the flakes. Does that make sense? So for example, if I call for 1/2 tsp. sea salt on the vegetables, add a small pinch more if you’re using Kosher salt. Don’t forget to share your photos with us! We’re catching up but will have a basic food photography guide for our members in the next couple weeks. - We updated the FAQ page with a couple quick videos to walkthrough a few common questions we're recieving from folks about the archives and the grocery list. button at the top of the grocery list to toggle whole recipe's worth of ingredients out of your list. No more cross referencing recipes to the grocery list. 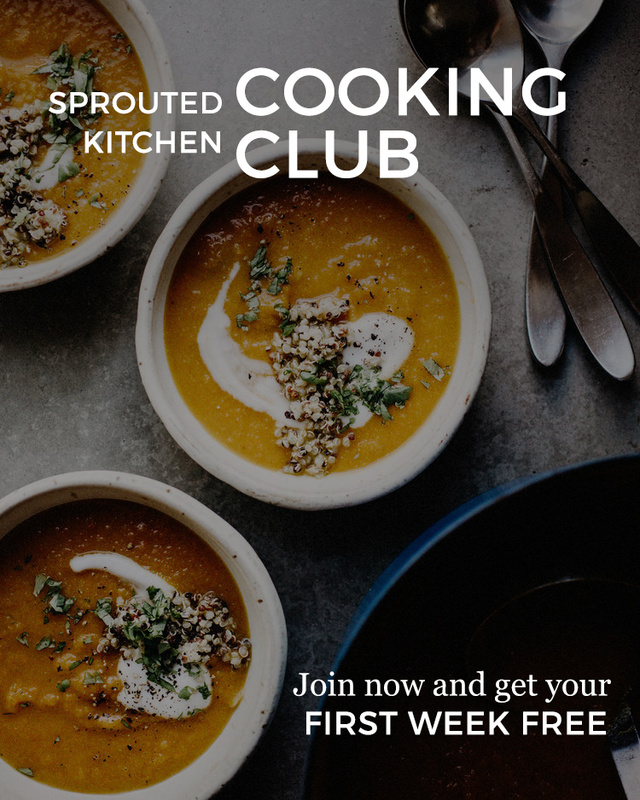 - You can now mark favorites in the Cooking Club Weekly Archives. Click on a recipe title to mark it as a favorite and sort favorites using the "show favorites" checkbox at the top of the page. The base is part pesto, part chimichurri. It doesn’t really fit in a culinary box, but it’s bright and feels like early summer. If you’re pressed for time use a pre-made pizza dough or use a store-bought pesto or Zhoug sauce from Trader Joes if you like things spicy. Early season asparagus is usually pretty skinny, but if yours seem thick, slice them in half lengthwise first. My kids will eat veggies on pizza if they are chopped small and have some melty cheese on top of said vegetables. We wrote goat cheese in below, but mozzarella is great too. In a small bowl fitted with a colander covered in a paper towel, place in the zucchini slices and sprinkle with 1 tsp. salt. Toss to coat, cover with the rest of the paper towel, and set aside while you prepare the other ingredients. We are trying to get some of the water out of the zucchini so it does not make the crust soggy. The sauce will make more than you need, and we’ll repurpose that in the Shawarma bowls. Make Ahead: The green herb sauce can be made up to 3 days in advance. All veggies can be prepped ahead, and the pizza dough (if making your own) can be made the night before. Use it Twice: The green herb sauce works twice as a drizzle on the Shawarma, or, you can spread it on sammies, serve it with salmon, or spread or over crispy toasts for a springy bruschetta. Kid Friendly: Chop the vegetables into smaller pieces. Looks pretty when they’re big and springy looking, but my kids do better with a small chop. Carnivore Addition: Prosciutto would be great here, or cooked, crumbled sausage works too. Gluten Free: For grain-free options, I think that Capello’s has a great version. Their “Naked” crust crisps up well, just follow the package instructions. We also like the Caulipower brand. Simple Mills also has a boxed pizza crust. Extra Credit: Make your own pizza crust! Try to make it the night before to allow rising and resting time. If you have the wherewithal to do this on a weeknight, I salute you. Using a mandolin, slice the zucchini into thin rounds. Set aside or drain (see headnote). To make the green sauce, pour olive oil, vinegar, lemon zest, juice, basil, parsley, shallot, garlic, chili flake, and salt into a high speed blender or food processor. Pulse in 10 second increments, scraping down the bowl intermittently. Continue to pulse until you have reached your desired consistency. For a thick, smooth sauce, blend for about 1 minute on low-medium. It should be a bright green color and thick. Preheat the oven to 450. Place your baking sheet in the oven to get it hot. Prepare your toppings, chopping the asparagus and artichoke hearts. Drain off any excess water from the zucchini. Make sure all of your toppings are ready to go once you begin to roll out the dough. On a cutting board, sprinkle on flour, begin shaping your dough. Use your hands to push and stretch the pizza dough super thin. Use a rolling pin if needed. The dough will rise as it cooks, so the thinner the better. Don’t overwork the dough, or the gluten will make the crust dense and chewy. Alternatively put your pre-made crust on the baking sheet. Carefully remove the hot baking sheet from the oven and drizzle a bit of olive oil on the pan. Transfer your dough from the cutting board to the hot pan. Bake the crust for 5 minutes. Remove from the oven and add the toppings. Moving quickly, spread about ½ cup of the green sauce onto the dough, leaving about a 1/2” border. Layer on the zucchini, artichoke hearts, and asparagus. Sprinkle on goat cheese or mozzarella, and drizzle the top with olive oil. Return to the oven, and bake for an additional 10-12 minutes. Depending on how crispy you like your crust, you could always hit it with the broiler for about 2 minutes. Remove from the oven, and top with a sprinkle of parmesan, arugula or fresh herbs and a pinch of red pepper. Cut into slices, and serve immediately. Serve with a side salad if desired. Allow for at least 1 hour for the chicken to marinate, preferably overnight. The beauty of this recipe is it can please almost any diner at your table. I like it served over a pile of arugula dressed with an herby vinaigrette, a swoosh of hummus, a squeeze of lemon, and a sprinkle of crunchy pine nuts. Littles could enjoy the components wrapped up in warmed naan or pita. This week, we tried to have components from each recipe that could be re-used. This is the key to my weekly dinners coming together: mix and match sauces and proteins that can be repurposed in a myriad of ways. Here, you can use some of the leftover herby sauce from the pizza to drizzle over the greens. The extra chicken this will yield can top your Greek fries the next night. If you can’t find split chicken breasts, you can swap them out for boneless thighs. Just reduce the temp to 400 and roast for around 30 minutes, depending on the thickness of the chicken. Look for smaller breasts, the giant ones get a bit unwieldy. If you go boneless skinless, thighs stay juicer after a roast in the oven, and while we were taught to think of thighs as “less healthy” than a breast, the increased fat is negligible. Make Ahead: The marinade can be made up to 3 days in advance. The chicken can be marinated overnight, or start it in the morning if you are a micro-prep person. Use it Twice: The extra shredded chicken is great on the feta fries. All ingredients can be served in a salad the next day or in a wrap for a meal on the go. A quesadilla could also be good for littles. Kid Friendly: I called for naan in the ingredient list so you could make a gyro-type deal for kids, or serve with brown rice. You could leave out the chile flake if your kids are sensitive to heat, but otherwise the flavors are more “smoky-warm” than spicy. Vegetarian Swap: Use the same marinade for extra trim tofu or even two cans of chickpeas. Roast either of these options before or after the vegetables, as the moisture from the vegetables will keep the beans or tofu from crisping at all. Pour all marinade ingredients in a small jar, and shake vigorously. Save the juiced lemon halves for later. Set aside 2 Tbsp. of the marinade for the veggies. Pour the remaining marinade in a large bowl or gallon sized baggie. Pull the skin away from the breast meat, so the marinade can get into the flesh. Massage the marinade into the meat, and return to the fridge for at least one hour, or overnight if you can. Preheat the oven to 425. Line two rimmed baking sheets with parchment paper and set aside. Remove the chicken from the fridge, and allow it to come to room temperature. Place the marinated breasts skin side up onto one of the baking sheets, making sure you transfer all of the marinade from the bowl/bag. Pull back the skin on the chicken, and massage some of the marinade onto the flesh to make sure it is seasoned well. Add the previously juiced lemons to the baking sheet. Place the chicken in the bottom 1/3 of the oven. Roast for 15 minutes. While the chicken is roasting, mix together cauliflower florets, peppers, onions, and 2 Tbsp. of the reserved marinade in a large bowl. Toss to coat. Spread evenly on the other lined baking sheet. After the chicken has roasted for its first 15 minutes, add the veggies to the oven. Roast for 30 minutes, stirring halfway through, or until the vegetables are tender and beginning to brown on the edges. Remove the chicken from the oven, and using an instant read thermometer, test the chicken at the thickest part of the breast and make sure it is 165. Depending on the size of the breast and the bone, they will take anywhere from 40-50 minutes to roast - the bone adds to cooking time, adjust accordingly. While the chicken is cooling a bit, quickly toss the arugula and about 1-2 Tbsp. of the green sauce together. Season with salt and pepper and set aside. Alternatively, a drizzle of olive oil, vinegar, and a squeeze of lemon would also work here. When the chicken is cool enough to handle, remove the skin and bones, and discard. On the same baking sheet, shred the chicken with two forks. Mix the shredded chicken with the juices and crispy bits leftover from roasting on the sheet pan. Squeeze the charred lemons over the top. This keeps it juicy, and gets extra flavor into the meat. To serve, swipe a large dollop of hummus onto a plate, top with a bit of arugula, the roasted veggies, chicken, pine nuts, and more green sauce if desired. You can also serve in naan or pitas. Part salt and vinegar chip, part Greek salad, these are a full meal that can be eaten family style right off of the baking sheet. They are lovely as a vegetarian main, and would be great with crispy chickpeas. Add leftover shredded chicken from the Shawarma (recipe below), you can make these more of a complete meal. If you are an unapologetic ketchup addict, take the extra step and make a batch of the roasted pepper ketchup. It takes less than five minutes, and is a dippable condiment both adults and littles will love. You could skip the sauces all together, or make the tzatziki from the gyros from week 27 if you want something creamier. Make Ahead: The ketchup can be made up to a week in advance. The Greek salsa can be made the night before, and the chicken can be re-purposed from the Chicken Shawarma. Potatoes can be parboiled in advanced and stored in the fridge until you are ready to roast. Use it Twice: The ketchup can be used up on chicken tenders, or any protein. The Greek salsa will make more than you will need, so turn it into a chopped salad the next day with arugula, cucumbers, vinaigrette, and your protein of choice. Kid Friendly: Easy on the tomatoes and herbs for my little people but roasted potatoes are an easy sell here. Carnivore Addition: Add leftover shredded chicken (recipe below), or ground turkey cooked up with 1 tsp. dried oregano, 1 tsp. salt, a pinch of chili and ½ tsp. of garlic powder. Low Carb: You could serve the salsa and feta over roasted cauliflower florets or cauli-steaks. The salsa is also great on top of fish or grilled steak. Dairy Free: You can skip the feta, the olives and capers should give you the salty-briney flavor. Extra Credit: Whip up some tzatziki from week 27. In a blender or food processor, pour in ketchup, jarred peppers, smoked paprika, and red wine vinegar. Puree in 30 second increments, scraping down the sides between intervals. Continue until the mixture is smooth. Taste and adjust seasonings to your liking. Set aside in the fridge. Preheat the oven to 425. Line two large rimmed baking sheets with parchment paper and set aside. In a large pot, pour in sliced potatoes, white vinegar, salt, and enough water to cover the potatoes. Turn the stove to medium high heat and bring to a boil. Once the water is boiling, cook for 5 minutes, or until the fries are just barely tender. Drain the fries very well, and transfer to a paper towel lined plate to ensure all of the water is off of the fries before they hit the oven. Spread the fries evenly on two rimmed baking sheets. On each sheet, drizzle the fries evenly with olive oil, oregano, salt, and garlic powder. Toss gently to coat, and spread the fries out to ensure there is ample space between them. Place into the oven and roast for 15 minute before flipping the fries with a spatula. Rotate the sheets in the oven, and roast for another 15 minutes, or until brown and crispy. While the fries are roasting, make your Greek salsa. In a medium bowl, toss together tomatoes, olives, capers, onions, lemon zest, red wine vinegar, olive oil, oregano, fresh dill and sumac (if using). Set aside. Remove the fries from the oven, and turn the broiler on. Top the fries with crumbled feta, the Greek salsa, and chicken (if using). Return to the oven and broil for 2-4 minutes, or until the feta is bubbling and the chicken is warmed through. Remove from the oven, top with chopped fresh herbs, and serve with smoky pepper ketchup. Eat immediately. The sauce makes up the bulk of the work load here and even that is mostly hands off. I wrote in bourbon at the end because it balances the sweet a bit, but is not imperative. We wrote a dairy-free version of caramel below and while more coconut than the classic with butter and cream, it is SO good. It will likely make more than you need, and makes a delicious dip for sliced apples or pretzels. You can also halve the recipe successfully, but give it the same 20 minutes of cooking time. You can top how you please, and if you have little ones, they can get creative with their own toppings. I think these would be great plated over a generous swoosh of thick, Greek yogurt or labneh to balance out the sweetness of the sauce and bananas. But, a few scoops of vanilla bean or buttered pecan ice cream also work wonderfully. Make Ahead: The sauce can be made up to two weeks in advance. If it separates a bit in the fridge, simply warm it up in a saucepan or microwave and whisk before using. Use it Twice: The sauce can would be great as a layer on a tart or drizzled over grilled stone fruit, or as a dip, as mentioned in the headnote. Dairy Free: There are some great DF ice creams on the market - one of my favorites is So Delicious. In a heavy bottomed sauce pan, whisk together coconut milk, sugar, and cinnamon. Bring to a simmer, and cook it for 20 minutes, stirring intermittently. Reduce until the sauce has thickened a bit. It will continue to do so as it cools. Remove from the heat, and add vanilla, salt and bourbon, if using. Set aside to cool and it will thicken as it comes to room temp. Preheat the broiler to low. Slice your bananas in half lengthwise. Place cut side up on a baking sheet. Brush with melted coconut oil/butter, and sprinkle with the sugar and cinnamon. Place on the top rack in the oven, about 4” from the broiler. Broil for 5 minutes until the tops have caramelized. This timing is highly dependent on your oven. So watch closely! Remove from the oven, and transfer to a plate or bowl. Top two banana halves with ice cream, a generous drizzle of caramel, dark chocolate chunks, pecans, or any other desired toppings. Serve immediately.